Well, it has been an interesting week here - we've had snow days, work days, last night was quilt guild and today was Bunco! That didn't leave a lot of time for sewing, but that's ok - I did manage to get my new Island Batik fabrics all snuggled into their spot in my sewing room and am ready to start working on the Mavelous Mini challenge. I even have a pattern picked out and fabric pulled, so I just need to start cutting! Are you ready for that giveaway I promised? I have some leftover 10 inch squares (27 in all! ), a couple of stash builder rolls, a hunk of Buttercream foundations and an Island Batik Pin! This will make a nice little bundle for someone to play with. I thought it would be fun to have this giveaway go through Valentine's Day and I'll do the drawing the day after. I really appreciate all of you for reading along and encouraging me in my quilting adventures (and all the other odds and ends that go on around here!). It wouldn't be near as much fun to write my blog if no one were reading it! Oh, and in other good news, I'll also start this years Block of the Month next Friday! I had a bit of a delay due to the changes at Craftsy, and dealing with that set me back a bit, but now I am ready to get started. Seashore Splendor will feature a nautical theme, with blocks in different sizes. I'll send a new block every other week, and will give you the layout for the finished quilt at the end. I'm loving the design, and I hope you will too! Hope you have a great weekend - we are wondering if we will get snow or not...I'll let you know! I think if I had a day to work on any project I would work on some new designs that I've been thinking about. The batiks are beautiful. I would love to play with them. Beautiful batiks! If I a whole free day for any project I'd bust out my adorable hoard of llama fabric and get started cutting for my king sized south american quilt. I have several projects going at the same time, so I would advance several of them at the same time - when I got tired of quilting the drunkard's path, I would work on either Sunshine in Winter or ATC holder, and the rail fence would be worked in as a leader/ender. I HAVE to work on my UFO's. But I really want to start a new quilt. lol If I start a new applique project for night time, I can do both. Win, win! Do we need to sign up for the BOM or will it come with your newsletter? To finish Quinn's quilt for graduation in June! I would work on my "OH MY STARS" quilt. Thank you for the giveaway. I am looking forward to your new BOM. I have really enjoyed all of them so far. Thanks for doing this for us. Love these Island Batiks! The colors are awesome and would be perfect for a quilt I wish to make! Thanks for the giveaway. I would love to work on something just for fun - with no deadline. Congratulations on becoming an Island Batik Ambassador. 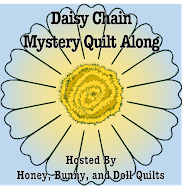 If I had a whole day for sewing, I would get caught up on a weekly mystery quilt where I am 3 months behind. Work on the table runner, so I will be free to pick a new project. Congratulations on the new goodies. Have fun being creative. I need to finish my great niece wedding quilt, she got married 9/1/18, lol. I need to quilt and bind a few of my UFOs before I start anything new, so I need to piece a backing or two. I’m currently working on a paper piecing project - Dinner Plate Dahlia. Need every day to make progress on this ambitious project! What gorgeous fabrics. Well, I am starting to learn applique. So, If I had a whole day, I would be doing this. I’m making a quilt for my third great grandchild. Levi is now overdue but that works for me! I’d like to have it finished and quilted before he actually arrives. Then I will just have to make the label, bind it and pop it in the mail. Can’t wait to see what you are working on. An entire uninterrupted day for sewing/piecing/quilting would be so much fun, and productive. I have several projects in assorted stages of completion (don't we all), and my goal this year is to finish at least 12 of them for charity and 12 for personal gifting. Winning this giveaway would give me more possibilities for ideas that are percolating. Gorgeous fabrics! Thanks for the giveaway! I have to make quilts for 2 grandchildren and a day to do so would be perfect. I'd like to work on the block of the month blocks I am behind with or work on a quilt I am making for my son. I would work on a quilt for my granddaughter. Can’t wait to see the new project and the blocks. i have a few quilts for my grandchildren that need to be finished. The blocks are done, they just need to get pieced together. Thank you for the giveaway opportunity. 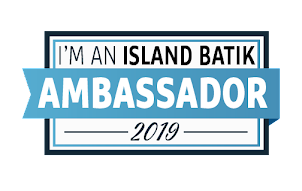 I am enjoying seeing what you and the other Island Batik Ambassadors create. I love batik fabric. I checked out your etsy shop and you have some beautiful quilted things. And I enjoyed your blog also. Thats why I was led to your etsy site. Thanks for the giveaway. If I had unlimited time I'd make a double wedding ring. I would work on my Jinny Beyer Craftsy BOM. I work on whatever is out & calling my name. Right now I'm working on a mini quilt I started last spring before I fractured my clavicle (which was diagnosed as shoulder impingement until I was diagnosed with Multiple Myeloma last summer)! I'm in remission now & finally feeling like sewing again! I have many projects in the works. This week I am working on following a mystery started in the fall and my Judy Niemeyer project. I would want to make some fabric baskets for my sewing room. I am currently wanting to do a heart quilt and a pinwheel quilt so I would work on one of those. I currently have a scrap quilt on my dining room table that lacks the inner border. Bought and washed the fabric yesterday so will cut and sew that next. The. Time to quilt it.